The weather didn’t disappoint us after a glorious warm week. 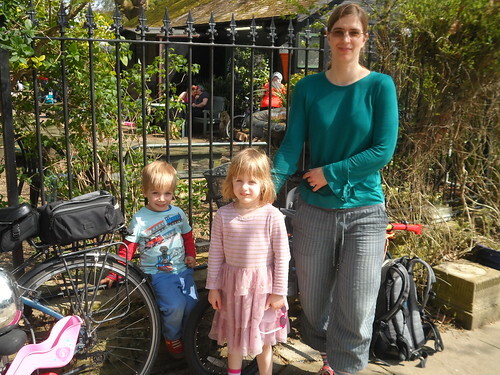 Waiting for me at Sidings was Nicola, Anna and her two children Ellen and Eric, aged nearly 5 and nearly 3 respectively (days count to small children). 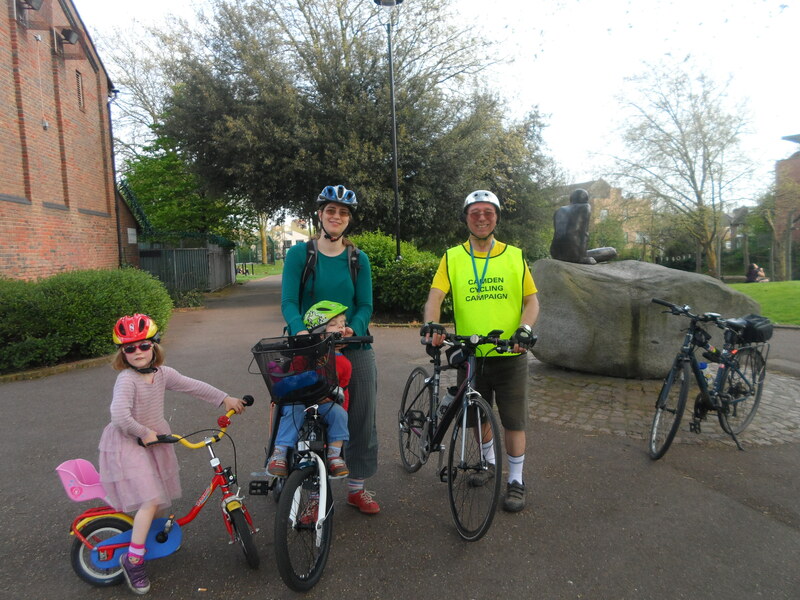 Eric was riding with his mum in a child seat but Ellen rode her own bike: very small with no gears! 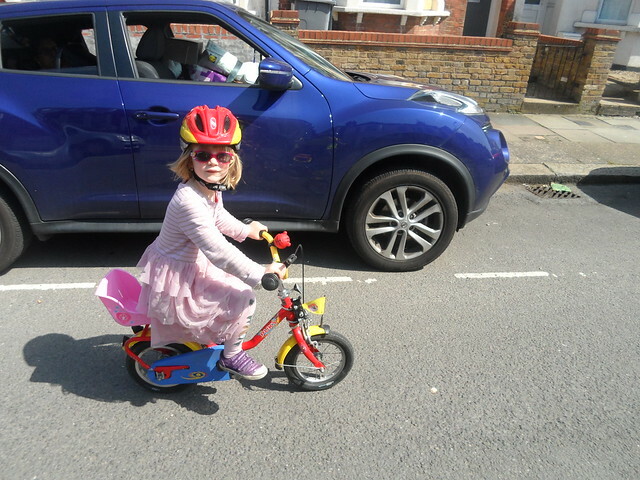 In our experience the younger riders cope very well despite the inadequacies of their bikes, and Ellen was no exception. 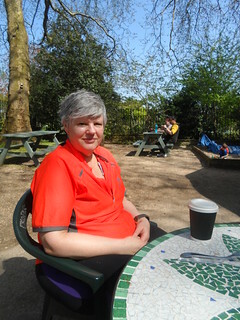 She had to walk and push up some of the steeper bits of the ride such as Chatsworth Road (Quietway 3) and up to the top of Gladstone Park. As usual we caught our breath after the climb up to the top of Gladstone Park and looked around the remains of Gladstone House. Ellen remarked that the grass served as carpet in the rooms. Coming down the steep paths by the tennis courts is more tricky than going up. You have to keep your hand on the brakes to stay in control of your bike. Again Ellen was equal to the task. With such a group we had to stop at the children’s playground in the park to let them play on the slide and the roundabout. Then continued back to the café near the entrance where the toilets were. Crossing Willesden High Road we continued on to Roundwood Park. Everyone remarked how pretty it all looked with bright, colourful flower displays. 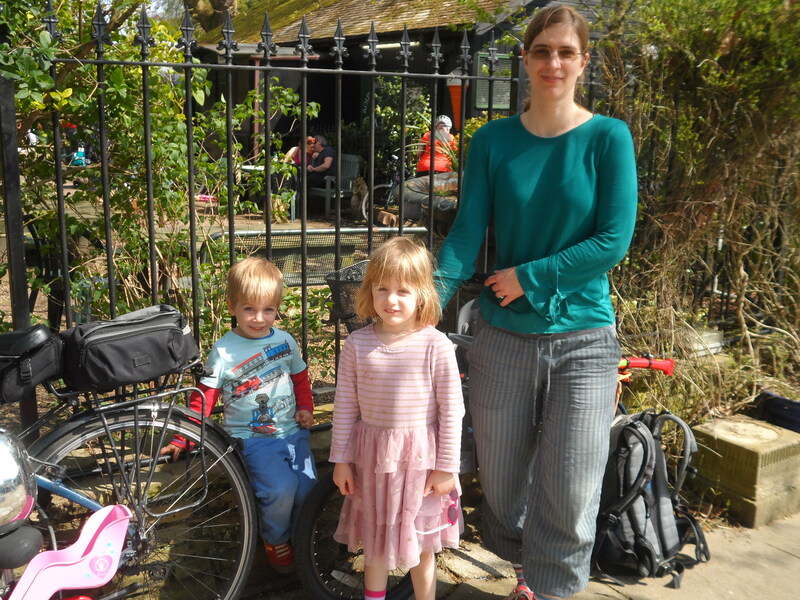 We cycled all around the circumference stopping at the café, this time for some refreshment. 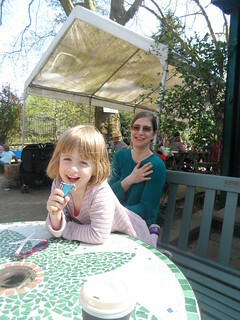 The children had been looking forward to their ice creams for a long time. The adults had coffees. The waiting time for cooked food was about 40 minutes so I just had a pastry. Roundwood has so many attractions, particularly for children. 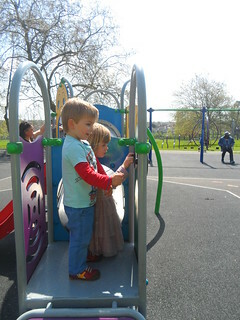 There is a playground with equipment for the younger child but Eric and Ellen found the sand near the café most enticing and had fun while the rest of us discussed technical matters as we found we were all in the IT world in different roles. As we left Anna and Nicola confessed that they’d never been to Roundwood Park before but would like to again. 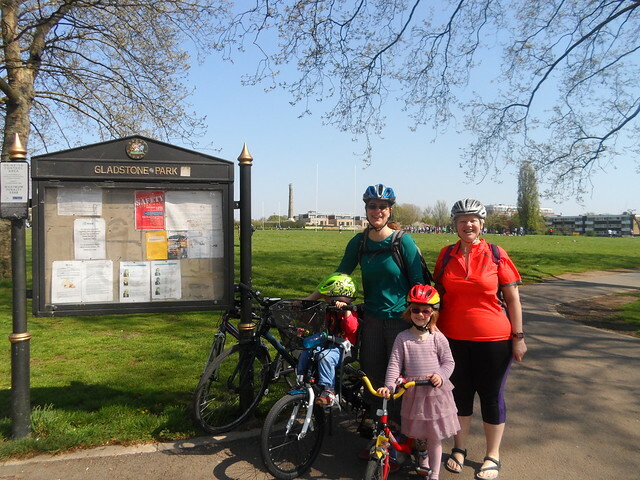 Anna was concerned that the children were getting tired and we decided to cut the ride short and go straight home instead of stopping at Queens Park. 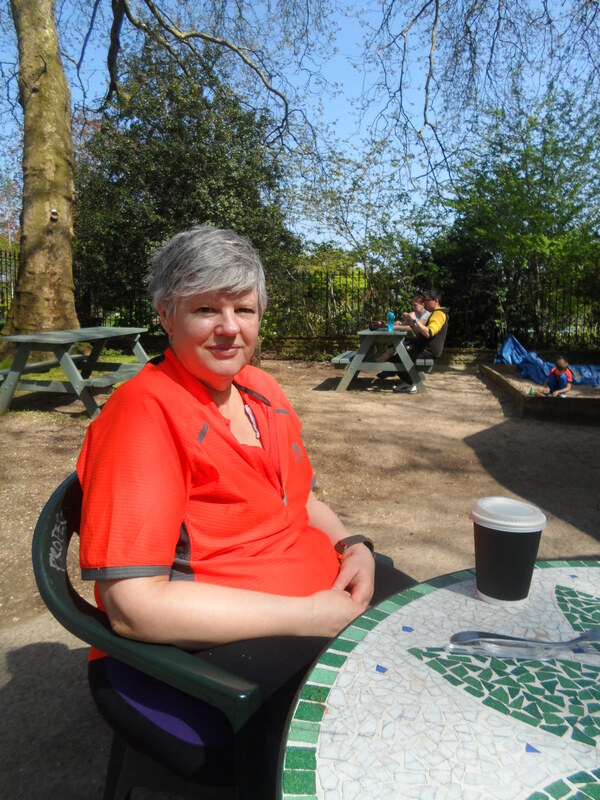 We still had to pass by some of the other parks such as King Edward VII park, which is next to Willesden Sports Centre, and Queens Park, which I pointed out to Anna as we passed by. We also noticed another park along The Avenue labelled Tiverton Green on the map, which we wouldn’t normally pass. 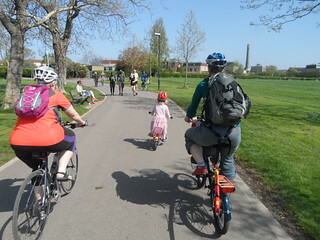 This had lots of children on their bikes cycling around a simple road system marked out in the playground. Anna could bring the children on their bikes to use this in future. Ellen wanted to race me on the way back which we were able to do on the quieter stretches. She was enjoying herself right to the end of the ride. When we arrived back at Sidings we realised that Eric was fast asleep in his child seat. We had to hold him up for the final photos. If you are measuring by numbers attending, this ride didn’t score very highly. But I considered it a great success because it was the first time that Anna and the children had been able to go cycling together as a family. Ellen gained much confidence by cycling on roads for the first time. Apparently, Ellen will be getting a new bike very soon. Her current bike will be passed on to Eric and they can all cycle together. Perhaps next time Dad can borrow one of the spare bikes I have stored and come with us. I must say a big thank you to Nicola for being such a support as backstop and to the children for being such good riders and passengers. And, finally, to Anna getting herself and Eric round the course. This was truly a family ride. I hope you all enjoyed it. Thank you for coming.